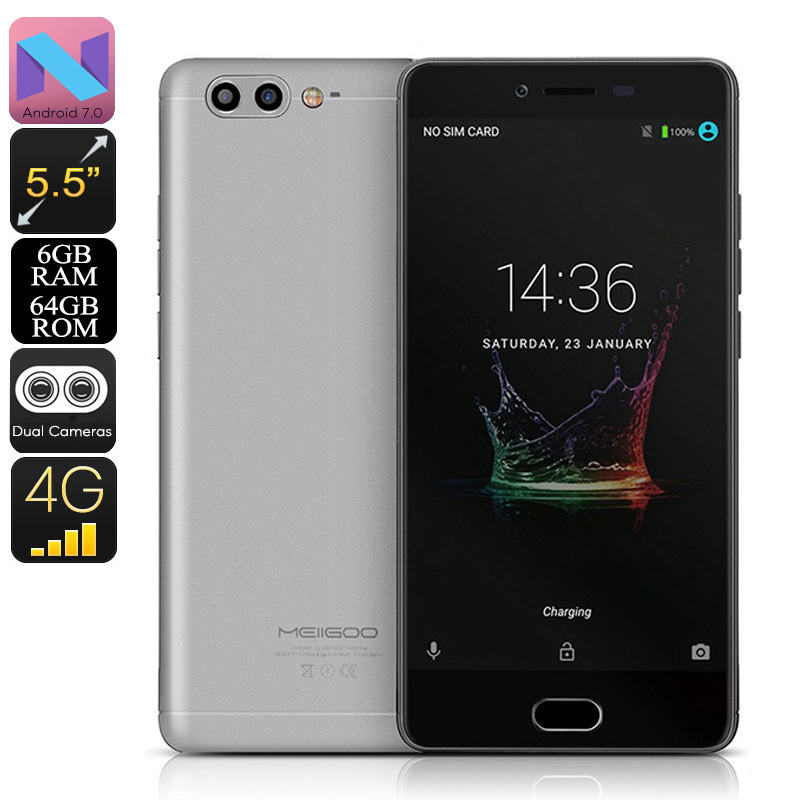 Successfully Added Meiigoo M1 Android Phone - Octa-Core CPU, Dual-Rear Camera, 6GB RAM, Android 7.0, 5.5 Inch FHD, 4000mAh, 4G (Gray) to your Shopping Cart. Enjoy a powerful smartphone experience at an affordable price with the Meiigoo M1 Android phone. This Android smartphone packs the MediaTek6757 processor. As an Octa-Core CPU that has been clocked at 1.6GHZ, this chipset brings along a powerful yet energy-efficient performance. Along with a whopping 6GB RAM, this Android phone truly is capable of handling anything you throw at it. Whether it is games, films, or Apps – nothing slows the Meiigoo M1 down. It packs a sophisticated 4000mAh battery that delivers hours’ worth of usage time. Thanks to this, you can enjoy your favorite media throughout the day without needing to recharge. With 64GB internal memory and a 128GB SD card slot at your disposal, the cell phone provides you with plenty of storage to keep your files and media. All your favorite films, series, and games can be enjoyed on the phone’s stunning 5.5-Inch display. Treating you to beautiful 1080p resolutions, this Android phone is sure to enhance your mobile media experience. Play Store access lets you easily download the latest Android software features available. All can be enjoyed without experiencing any lag thanks to the phone’s up to date Android 7.0 operating system. 4G connectivity allows you to take advantage of the fastest mobile data speeds out there. Therefore, you’ll always be able to browse the web, stream content, and download media. No matter where you’re at, this phone always keeps you connected to the web. It furthermore comes with Dual-IMEI numbers thanks to which you can be reachable on two numbers while using merely one device. This is great for business men that wish to separate their work from private life in one Android device. The Meiigoo M1 Android phone comes with a 12 months warranty, brought to you by the leader in electronic devices as well as wholesale Android smartphones..